The Internet is without a doubt a fascinating land, provocative, worthy of calling itself a “miracle” of technology. Exactly by its numerous positive and revolutionary attributes, but also its capacity of “luring”, the Internet and virtual world may become in control, and users become slaves. The Internet and new technologies have revolutionized communicational, socialization and shopping behavior, but they have also changed the users’ expectations and way of thinking. Although we are actually speaking of the same world, the same needs, the same people, the same relationships amongst them, what new technologies have changed profoundly are the rules of the “game” and the level of certainty that we can have in the virtual world. Some elements are new, but ready to be discovered and we can make this a good educational exercise. 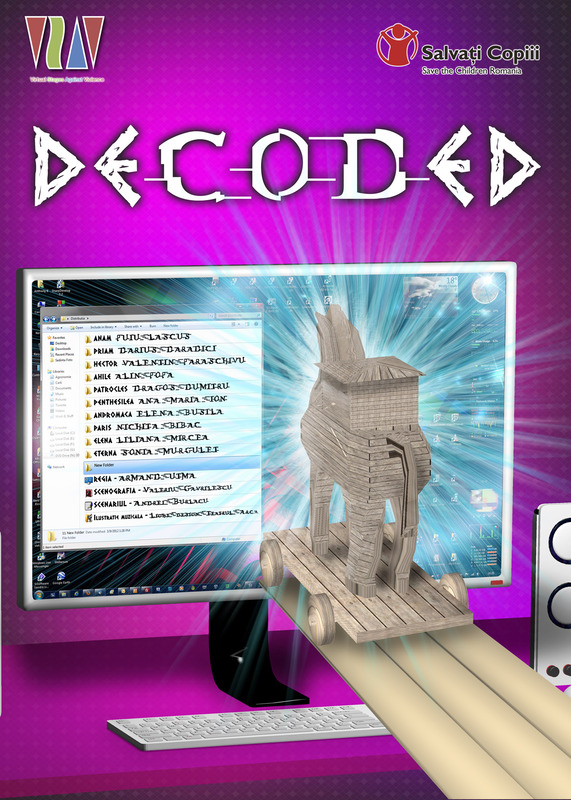 The play “Decoded” encompasses the mysteries in front and behind the computer monitor and the characters seem to hide many secrets both online and offline. In the play, the heroes in the legend of Troy come to life and enter our contemporary world to share with us some of their wisdom. Because of the situations that unfold comparing the changes generated by the continued development of the digital environment, spectators will understand and discover real threats. Also, the play focuses on marking significant positive aspects of new technologies used in a responsible manner. Anam is the narrator. He plays a crucial role in communication with the audience. His words illuminate the audience and offer information necessary to understand the story beyond the actual situation of the characters. Priam is the king of Troy. Although he does not use social networking sites he knows the potential risks and wants, being aware of the danger, to support the young members of this citadel to reach a high level of awareness. Yahoo Messenger, Email, Skype, Facebook, Twitter, MySpace, forum, blogs, spyware, viruses are just some of the problems our heroes encounter. Even though some elements might be new for those who did not grow up in this digitalized world, Priam knows that the dangers are the same. The other characters you will recognize on first site. They appear frequently on social networking sites and in the fascinating world of the Internet, but they always hide behind perfect profiles. The challenge for the public will be to discover Who and how these characters are in real life… Does the virtual world correspond with reality? We’ll just have to watch Decoded together and unravel the mystery!